One of the finest examples of an urban space that exists in Florence, the Piazza della Santissma Annunziata has made an impact making a large space usable for people through unifying the space through facades, geometry and underlying structure. 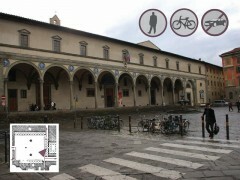 The square reflects many characteristics that were valued during the Renaissance when the various components were added to the space. ItaliaDesign conducts primary and secondary research into a wide range of topics contextual to understanding Italian Design and Innovation. The projects come from four sources: research papers published to this site that formalize findings that combine primary and secondary research; information models that capture complex relationships and content in chunk-able and useful information structures; primary research projects completed in-field in Italy, usually of an ethnographic nature; and, secondary research topics completed by the teams prior to in-field work. Featured projects appear on this page.